The RNID's Text Relay service can be a veritable lifeline for people who are deaf or hard of hearing and struggle to hear the voice on the other end of the telephone. Many deaf people have textphones and use these to make calls to others which textphones, although the use of these is becoming a little obsolete thanks to the rise of instant messenger services on the internet. But if a deaf person wants to make a telephone call to someone who does not have a textphone themselves, then they need to use the Text Relay service. The Text Relay is a cross between a normal telephone call and a call between two textphones. Basically, the person who has the textphone uses it as normal to call the person with the telephone. They simply need to dial 18001 before the full number of the person they are calling to ensure it is picked up by the text relay service. An operator then intercepts the call and takes the messages from the person with the textphone before passing the messages onto the person at the end of the telephone. 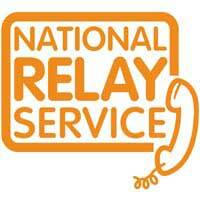 The person using the telephone will simply hear a message informing them that they are using the text relay service. This person then responds through the operator who types what they say as a message and sends it to the textphone user. It is a simple process but one which allows deaf people and their hearing friends and family to have phone conversations, although the nature of it means that these conversations do take much longer than a normal voice call. Many people hear about this innovative service and assume that it must be expensive, as such useful things often are. But the reality is that the text relay service costs no more to use than normal telephone calls. Any calls made will be charged at the operator's usual rate. In fact, because the text calls actually take longer to make than a voice call, text relay users who are deaf or hearing impaired may even be entitled to a rebate for the text portion of their calls. Telephone providers should be able to give more details on this. As mentioned above, the rise of new technology has removed many of the barriers for deaf people having instant conversations, with instant messaging services. But, PCs can also be turned into textphones meaning the need for a separate phone is eliminated. All a person needs to do to set up as a textphone user from their PC is download a special programme from the text relay website. Knowing about textphones and how to use them is a really useful tool for anyone, whether they are deaf or not. Businesses in particular should make sure that their staff are well aware of the text relay service, especially if they regularly speak to the public on the phone. This will then ensure that they are always ready to suggest options for discussing business with people who may not be able to use a conventional telephone.